Singers must arrive by Thursday, January 3, 2019. Instrumentalists must arrive on Friday, January 4, 2019. The Bach Institute is a collaboration amongst Emmanuel Music, Oberlin College and Winsor Music. It provides students and young professionals with the opportunity to explore and perform Bach cantata arias. For nearly three weeks in January, students participate in the weekly cantatas at Emmanuel Church, study Bach cantata arias and perform them on outreach concerts in Boston and the surrounding area. 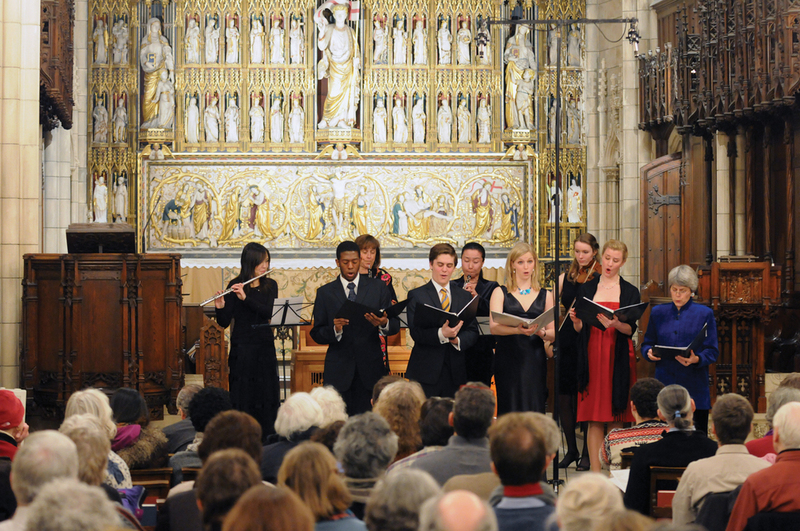 The culmination of the Bach Institute is a public concert at Emmanuel Church. Three roundtable discussions of the weekend cantatas with Ryan Turner and Pamela Dellal. Masterclasses and lectures with Bach experts such as John Harbison, Bob Levin, Christoph Wolff and Ryan Turner. Detailed discussions about the texts of the assigned arias, including the source material of the cantata texts, what the references mean, and how these difficult texts relate to the music and to Bach’s life and times. Intensive coachings with Emmanuel musicians Ryan Turner, Kendra Colton, Frank Kelley, Peggy Pearson, Heidi Braun-Hill, Michael Sponseller, and Rafael Popper-Keizer on shaping the music (ensemble as well as individual attention). Performances are at 440 on modern instruments. Students are housed with host families and are able to walk to Emmanuel Church daily or use public transportation. Our faculty represents approximately 170 years of collective Bach performance experience at Emmanuel Church. Our mission is to inspire and infuse young musicians with the passion we feel for the complex and awe-inspiring arias and duets by Johann Sebastian Bach, and to share our depth of knowledge with future Bach performers and promoters. Repertoire is assigned by the faculty. Assigned repertoire must be learned prior to arrival. Singers and instrumentalists may be assigned as many as five arias/duets. Instrumentalists may also be assigned instrumental chamber music. Scores for singers and keyboard players can be obtained at IMSLP.org. Parts will be provided for obbligato instrumentalists and cellists. Keyboard players must be prepared to read figured bass. Questions about the institute or your application materials? Problems with our online form?